Oldmeldrum's free parking restrictions began earlier this week. 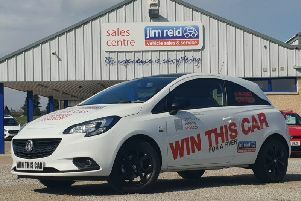 Businesses in the Oldmeldrum area are offering customers the chance to win prizes in the run up to Christmas. Over 30 local businesses in Oldmeldrum, Fyvie, Methlick and Tarves have joined forces to give thanks to customers who decide to shop locally this month. Anyone who spends £10 or more in any of the participating businesses will be invited to sign up for a free entry into a raffle which will be drawn on Christmas Eve. The five prizes available are vouchers totalling £1,000 which can be used in any of the local businesses up until July next year. The first place prize is a voucher worth £500, second place is a £200 voucher and the remaining three are worth £100 each. Businesses taking part in the raffle will display a sign in their window and will have entry forms for the raffle. A new entry can be submitted each time a customer spends £10 or more. Chair of the Meldrum Business Group, Jeff Goodhall, said: “ We know that our local businesses have a lot to offer with a large range of goods and services and we know that we have a lot of regular customers who value the personal touch and good service.